Is your Mother always there for you? Does she go out of her way to make sure you are happy and healthy, at times putting her own needs aside. Mothers like this deserve love and affection each day of the year. However, one day stands out more than others, Mother’s Day. This is the one day out of the year to melt Mum’s heart and show her how much you value and appreciate all she has done for you. But there is not much time left. Mother’s day is only a week away, so you need to ensure you have a heart-warming gift in mind. We are going to cover some great ideas you can use to show your Mother how much you love and appreciate her – INCLUDING free ideas to melt her heart. Use a blank wall in your home and cut out letters from a newspaper to make a title for your video, then stick these bits of newspaper on to some paper and affix them to your chosen wall. I wanted neat writing so I used my PC and printed separate letters on to coloured A4 card, then I then stuck they’s A4 sheets on to the wall using blu tack. Then I simply jazzed it up with some fairy lights as you can see in the picture. 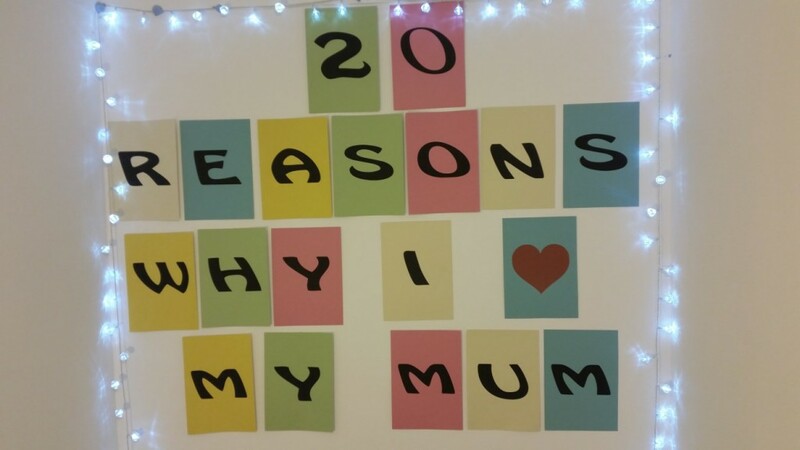 I then sat down and recorded my video titled “20 Reasons Why I Love my Mum“. This type of gift costs very little accept your time, and I am sure your mother will appreciate the thoughtfulness of a gift like this, plus it’s fun to make. All those pictures that didn’t make it into a photo album can be turned into a collage. This will only cost you a bit of your time, some glue and a frame. For a completely free gift, you can use an old frame you already have. Every Mum is looking for some help around the house without the whining and complaining. You could give her a coupon book filled with chores that you’ll complete free of whining and complaining. While this is a tried and true favourite, it never gets old. Every Mum wants to sleep in and have breakfast brought to her in bed. Make sure you clean up the kitchen after yourself though. You could combine breakfast in bed with hours of extra sleep, or you could just let her sleep in one weekend. She doesn’t need to be your chauffeur or breakfast maker every day. Give her the weekend free to herself. You can give your mother the gift of Laird or Lady . She’ll become a Lady of a castle in Scotland with the proper certification, her own email address and a small piece of land in Scotland. If you’re not a money saver and you have £6,000,000 to spend on your Mum, you could get her an iPhone 4S Elite Gold ‘The world’s most expensive phone’. However, you might want to consider that the iPhone 4S probably won’t support new application in a couple of years as there has been a few newer models from Apple since this one – I am just saying as I would hate for you to waste your money! For the mother who loves her wine, the Foldable Wine Bottle is a great gift that allows her to transport a full bottle of wine easily wherever she goes. It’s good for parties and picnics. Even if your Mum is no longer with you, she will always be in your heart and memory. But when Mother’s day comes around, you want to do something extra special. Was there a special meal you Mum made for you and your family? If so, it’s time to recreate the experience. Take out the old recipe book, and make your favourite meal. 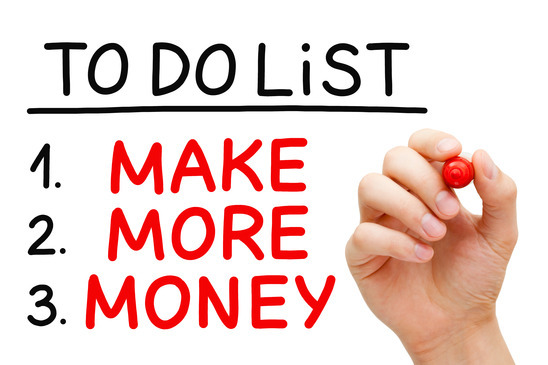 Make it into an event and invite your family over. It’s a great way to get everyone together to honour Mum’s memory. Was there something you never had the chance to tell your Mum? If so, write it on a small note card and tie it to a helium balloon ( You can buy Disposable Helium Balloon Kits on Amazon for a few pounds). After dinner, travel to a location that was special to you and your Mum. When you arrive, release the balloon with the heartfelt message into the sky. Sit silently as you watch the balloon slowly fade in the distance, which acts as a reminder of the impermanence of all things. Your Mum would do anything for you, and it’s time to show her how much you care. Let her know how much everything she has done means to you. These gift ideas are just the start; you have to make them your own and add your creative twist to ensure Mum gets a gift as special as she is. This week’s biggest bargain for 119 property buyers!